The idea of creating safe and easy access to and from the growing network of trails along the Chicago River gets us excited. What makes us even more excited is when improving access to the river also creates an opportunity to address long-standing concerns of our members and supporters. That’s exactly what’s happening in our quest to improve conditions for people walking and biking between Logan Boulevard and new river trail segments near Lathrop Homes. For the next six months, we’ll be working with residents, community organizations, design experts and city officials to develop a list of recommendations for creating safe and comfortable spaces to walk and bike between local hubs. Helping us carry out this work are our two project partners, Logan Square Neighborhood Association, a neighborhood-based organization, and Port Urbanism, an architectural firm. Strengthening the connection between Logan Square and the river is even more important as the city plans to complete the 312 RiverRun Trail and the redevelopment of Lathrop Homes in 2018 — both of which will add trail segments along the Chicago River. The .7-mile project study area starts at the intersection of Logan and Maplewood Avenue and extends east to Diversey and over the bridge to Lathrop Homes. 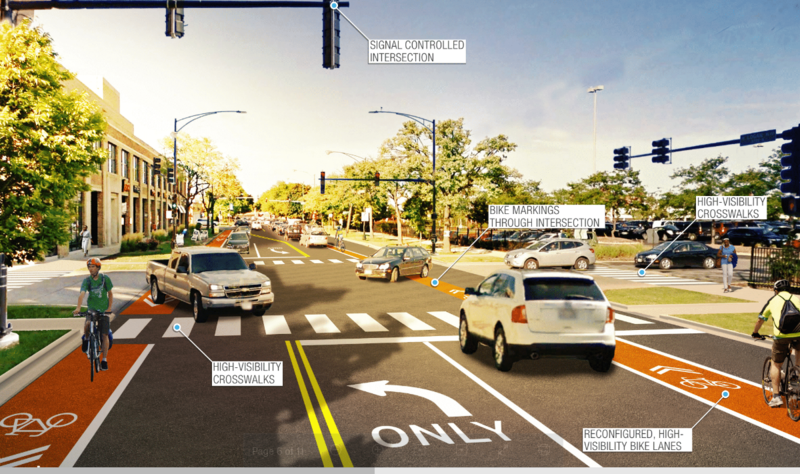 The study area includes high crash intersections such as Logan Boulevard and Western Avenue, which has been a top complaint among residents trying to walk and bike in the area. This stretch of Logan includes a diverse mix of residential homes, schools, churches, big box stores, aldermanic districts, entertainment venues and public housing. As a result, it’s critical that project recommendations reflect the input and perspectives of many community voices. We took a step in that direction during an initial meeting with neighborhood stakeholders at St. John Berchmans. Participants shared many priorities — some of which included: redesigning streets to slow down traffic along the entire corridor, adding a pedestrian crosswalk on the south side of Logan at Western, and creating better pedestrian and bicycle connections to Target and other businesses along Elston Avenue (pictured). So where is the project headed next? Our advisory committee will do a walk audit in the spring and document opportunities and challenges. We’ll also collect input from residents at events like the Logan Square Farmers Market, a party at Lathrop Homes and a food truck event at St. John Berchmans. The project will conclude in the fall of 2018. Our final product will be a document similar to Active Trans’ Chicago River Trail Action Plan. We’ll continue to champion the recommendations with decision-makers and organize around them after the project ends. The long-term goal is to find funding to build the changes the community desires. Do you live in Logan Square and/or spend time in this area and have ideas about changes that you’d like to see? Please contact Steve Simmons at steve@activetrans.org, 312.216.0472 with questions and comments. To sign up for Chicago River Trail campaign updates, please click here.